12.5" RCOS @ ~f/9 (2880 mm fl) 1.28 arcsec / pixel. eXcalibrator v5.0 for (g:r) color balancing, using 80 stars from the APASS database. CCDBand-Aid to repair KAI-11000M vertical bars. CCDStack to calibrate, register, normalize, data reject, combine the sub exposures and RGB color. PixInsight for gradient removal and non-linear stretching with HistogramTransformation. 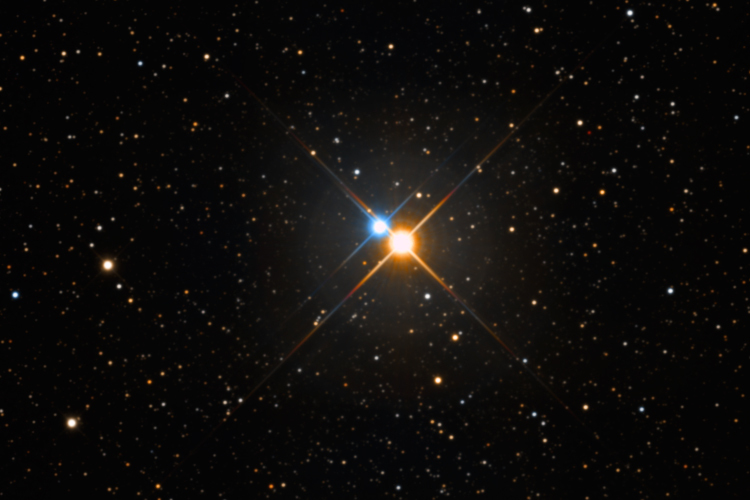 Albireo is a beautiful gold and blue double star in the constellation Cygnus. It is still unknown if Albireo is a gravitationally bound binary system or simply a chance alignment optical double. At a distance of 380 light-years, and with a separation of 35 arcsec, the possible orbital period is at least 75,000 years. Given this long orbital period, it will probably take several hundred more years to determine the nature of this double. 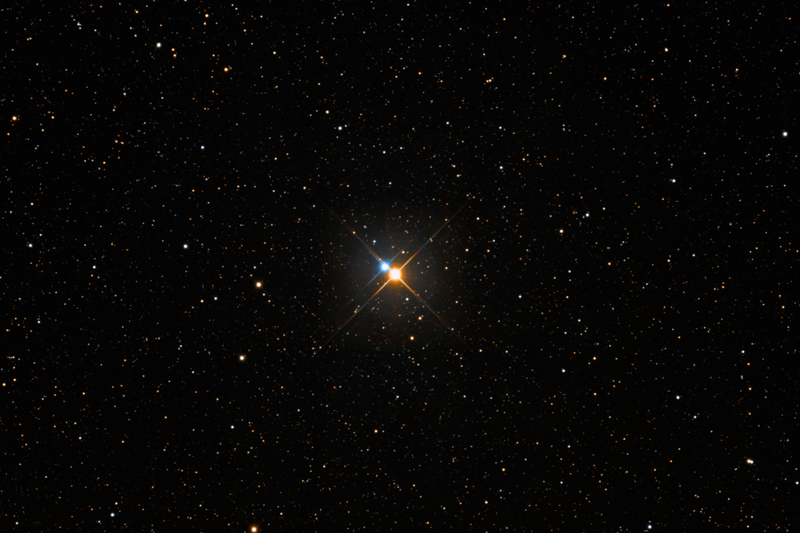 In 1976, gold colored Albireo-A was discovered to be a binary star, with a separation of only 0.4 arcseconds. Albireo-B is a fast rotating blue-green star with a surface temperature of about 13,200 K.
Although much about this double is unknown, we know that is a truly magnificent sight, when viewed with a telescope. Even the smallest of backyard telescopes will reveal Albireo's beauty.